Teenagers with special educational needs explore internet safety using shadow puppets. Here the puppet has two new online friends, but are they who they seem to be? Can either of them be trusted? During the first of two workshops for Lifeworks at Dartington, in Devon, members of the Kool Club made puppets, discussed and performed scenes around the topics of: passwords, sexting, Childline, Facebook and blocking unpleasant people. 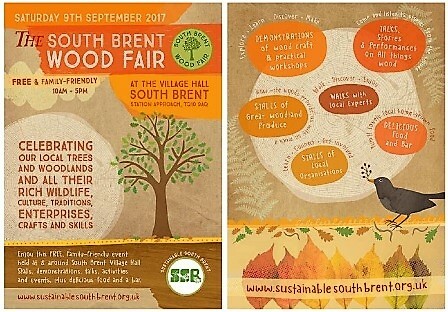 Create your own woodland animal or animated tree with Light Bulb Fantastic at Sustainable South Brent's Wood Fair. 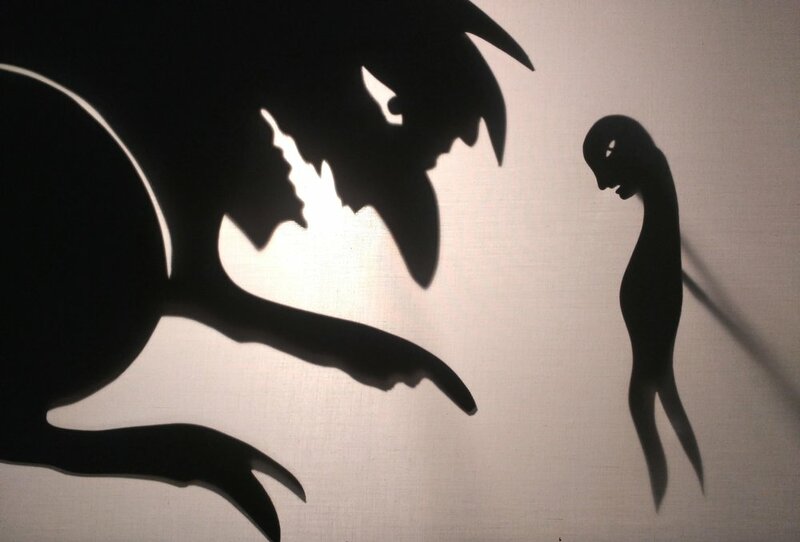 This shadow puppet workshop will be from 12.30 to 1.30pm, on Saturday 9th September, at the village hall in South Brent, Devon. Upstairs but there is a lift. Entry is free and there will be lots of other tree related activities and displays. "Stop Bullying" trial at Hooe Primary School, Plymstock. This trial confirmed that LBF's "Stop Bullying" workshop is ready to launch. In the morning of 6th July, 30 students, discussed, wrote, rehearsed and performed for each other a rich variety of scenes about bullying, its causes and solutions. The year 6 students, ( 10 years old ) produced such insights as the bully whose father is a drunk and the wheelchair used accused of being a bully when she tries to defend herself from taunts. "You get to really explain the emotion. I enjoyed performing because if it has happened to you, you can express it without telling someone"
"I enjoyed performing most because it makes people understand more what I have been through"
"I enjoyed watching, to see what other people think about bullying"
The class teacher, Sam, said "Fantastic session that has led to all the children feeling more comfortable talking about bullying"
27 participants of all ages enjoyed our workshop for Sustainable South Brent. Conversations were sparked off about the importance of the precious life in healthy soil, while tardigrades, termites and rotifers magically appeared before us. 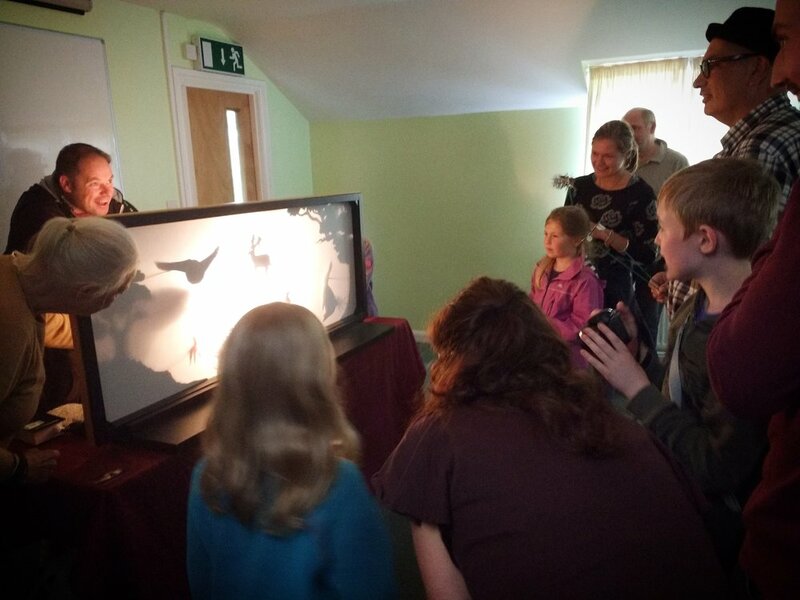 Adults and children alike enjoyed the shadow puppets and maths workshop. "A creative and interactive way to learn maths. I furthered my knowledge of fractions. I also think shadow puppet workshops could be a great way to develop social/communication skills and perform comic strip stories"